Mr. Powers, wearing a FCA windbreaker, enjoys (?) 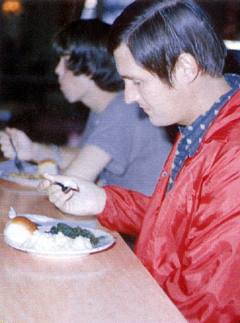 lunch in this photo from the 1977 yearbook. His plate appears to contain mashed potatos, a biscuit and something green. Can anyone identify the student sitting next to him? Robert S. Davies, class of 1979, who was from Trinidad , West Indies in the FCA days, has written in to let us know that he is the student sitting next to Mr. Powers in the above photo. Robert now lives in Louisiana.